1968 Massachusetts REGISTRATION Sticker - $20.00 : Bob Hoyts Classic Inspection Stickers, Add a Final Touch to your Restoration! This is a 1968 Massachusetts REGISTRATION Sticker. It is not an inspection sticker but you needed it to make your vehicle historically correct. 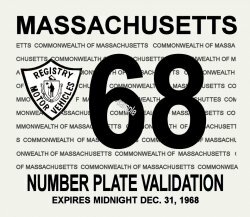 NOTE: Mass did not issue license plates in 1968 or 1969 and used this stickers to validate the 1967 license plate. Without this sticker, the 1968 Massachusetts vehicle was illegal. We believe that this is the last year Massacusetts issued windshield registration stickers. It appears that while Massacusetts discontinued plates with the year on them in 1967, making this sticker neccessary for 1968, most likely they began issuing license plate stickers in 1969. This sticker has our patented "peel and stick" format which allows attaching this sticker to the inside windshield upper center next to the rear view mirror.